There are two ways people usually learn about the existence of Pozitivni noviny (Positive News): By personal recommendation from friends or colleagues, or when searching the Internet for pictures. This unique Internet magazine has two mottos. The first one says that Pozitivni noviny is "illustrated reading for your pleasure" and the other that it is "an oasis of well-being and optimism on the net". It's necessary to point out that all the media without exception participate very efficiently and in the long term on in the keeping and spreading of of Rotten Mood. Since all newspapers, televisions and radios start the daily news with tragedies, murders, disasters or other bad news and three quarters of the news go on like this, our - citizens can never feel - that the developments in our country after the Revolution are heading the right way and that we live better lives than ever before. Not even the best statistics can erase from people's minds the feeling of fear, uncertainty, suspicion, envy, doubt, misunderstanding and alienation that permeate our thoughts in the shape of news and reports "seen with one’s own eyes, "heard with one’s own ears" or even "from one’s own experience". The media feed us with this, frightening us and inadvertently insisting that we used to live better lives than now, with fewer robberies, burglaries end murders, the streets were safer and people treated each other more courteously. The truth is that this was not so. Nobody was allowed to talk or write about these things, so we didn't write or talk about them and as a result, many things that eyes couldn't see and ears couldn’t hear didn't exist for most people. As the classic says,"....and that's what it’s all about". It is about the unbalanced media information, about the inability to see the consequences of negatively slanted journalists' work, about the demand for tabloid sensations, about the fact that hardly anybody stands up against these practices and that the powers-that-be do not offer any public-service alternatives. This is one of the reasons why Pozitivni noviny was started - to become an oasis of well-being and optimism (at least) on the Internet, where everyone can come and read the articles, where there is no violence, murder, disaster, unpleasant situations and negativity. On the contrary, people can soak in positive energy, inspiration, ideas, interesting tidbits, wise thoughts and advice according to their inclinations. But it is not enough just to isolate oneself on an island of kindred spirits and let everything around us go hang. 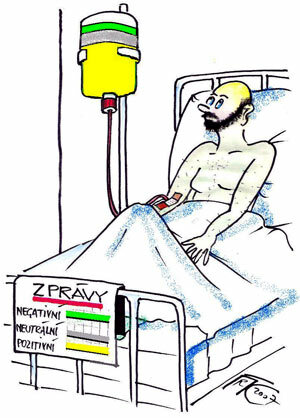 That's why Pozitivni noviny has launched a campaign against Rotten Mood and for optimistic mood. We realize that today we must fight for it much harder that for the change of regime back in 1989. That year people were anxious for a change, they knew what to get rid of and what and who to stand up against. Today, our enemy is hidden inside us, in our thoughts and souls and we can't and maybe even don't want to fight. It concerns us only seemingly, marginally, and it behaves like a creeping disease that you ignore until it strikes you down. Because of this we no longer trust each other, we are afraid to open the door of our house lest we have to deal with conmen, we are afraid of losing money, properties, we are afraid of losing our jobs, we fear the future, old age and incapability, we try to save money for our old age because we suspect that in a few decades nobody will work and earn money for us, hold back from politicians who lie to us unscrupulously, and more than anything cash in from their tenures of deputies, senators, councillors and other mandates for their nest their places on the gravy train are taken by others. How can anyone in this environment have a good mood? Good question but hard to answer. If you do a little survey of the news, which are served every day in our homes, you will get a surprising result: 70% of the news is negative, 20% is neutral and only 10% is positive. But try to turn my enumeration of facts of today’s life around and decide for yourself in what we have really succeeded, what has changed for the better, what advantages we have gained, how our life has improved. I am sure that you will have to think about it hard for a long time and it will be very hard to put together this positive mosaic. Let's demand that our media bring to us every day balanced news: 33% positive news, 33% neutral, 33% negative (or to use the vogue word, realistic) and leave the remaining one percent for the popular "TV Nova’s cute animal story at the end of the News". It only needs the top management of public-service and commercial media to be consistent. Maybe we should even consider a law, as the powers-to-be don't feel it as a public threat. But the professional associations, regulatory authorities, TV and radio councils, clubs and institutions for the defence of consumers should be the first to do something about this. After all, we are all consumers of information and we are threatened by it every day from every side. So please join in our appeal and pass this text or the ideas that it contains in any way and form among the people, media and institutions that can really do something about this state of affairs. It is rotten to have a Rotten Mood. It is good to be in a Good Mood. dull to have a dull mood. Tento článek byl v Pozitivních novinách poprvé publikován 23. 08. 2007. Pavel Loužecký: Jak jsem křtil kalendář Receptáře aneb Pozor na Milana! Otevřená diskuze k článku DEMOKRACIE = VĚC VEŘEJNÁ?